- FrancesCassandra: UK fashion, beauty and lifestyle blog. 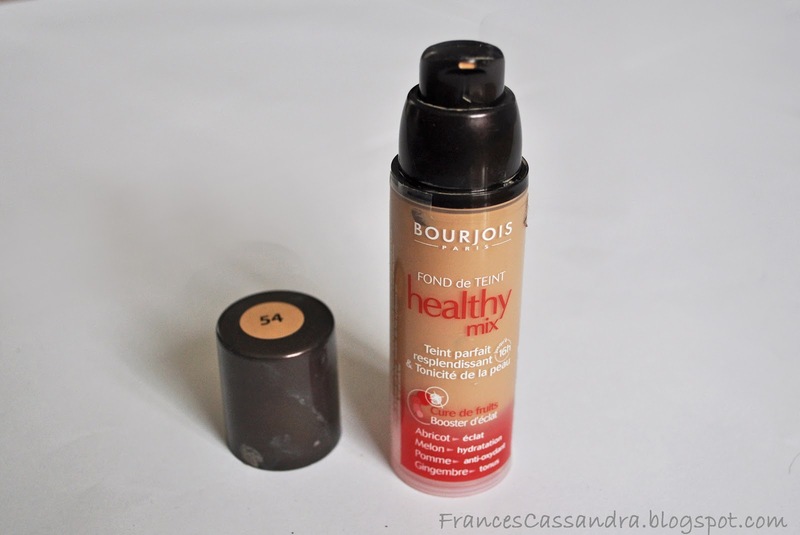 : Review: Bourjois Healthy Mix Foundation. So last year, this was probably one of the most raved about drugstore foundations in the blogging world, so I am sure you have seen endless reviews of this product, but I really love it, so one more can't hurt, right? As of late, I haven't been the biggest foundation wearer, I am used to opting for my Garnier Miracle Skin Perfector BB Cream or just a little bit of concealer to cover my under-eye circles and blemishes. However, I always keep a foundation in my make-up collection for those days where my skin really falls out with me or to use on special occasions or nights out. Previously, I owned the Rimmel Stay Matte Foundation, which I chose solely because of the cheap price tag, but it was awful and applied so streakily, so this time I decided to do more research and spend a little bit more money on a product that would work well. The shade I got is Shade 54 (Beige). It is a tiny bit too dark for my face (don't rely on a male to tell you if your foundation matches your skin tone when swatching in store) but it doesn't look too bad, I just know to go down a shade next time. One of the first and only negatives with this product is that it is only available in eight shades, which is a problem with most drugstore brands as they don't cater for those with very dark or very pale skin. The product comes in a pump dispenser, which I really like as it allows for you to use the right amount of product. I might have got a dud, however, as the first few uses the product just didn't want to come out, though this seems to have sorted itself out now. The consistency of this foundation is quite thin- it started running down my hand as I was trying to take the photograph. This makes it a dream to apply, however, I just use clean fingers to apply this to my face; I tried it with a foundation brush but it didn't work. It spreads evenly and there are no streaks. Despite being of a thin consistency, this foundation does give you a medium coverage. It won't hide everything but it evens your skin tone and covers blemishes whilst at the same time looking natural and not cakey, which is something that makes or breaks a foundation for me. The finish is very satin-y, not too matte and not too dewy; I think it really does give you a radiant glow and your skin is silky to the touch. I don't find that this foundation needs a setting powder, although some people prefer to use one anyway. I can't say I have worn this for 16 hours to tell you if it really does last that long but I have worn it from 9AM-7PM without any touch ups and it holds up quite well with only minimal signs of wear. I have combination skin; in the winter I tend to have dry patches, and in the summer it tends to get a little oily. Even though this foundation has a slightly matte finish, I don't think it gathers around dry patches, nor does it make your face feel even drier. I can't really comment on how well it works with oily skin yet but with it being shine-free, I have high hopes for it. The last thing I am going to comment on is the smell. This foundation has quite a fruity fragrance that disappears when it is applied. This personally doesn't bother me as it isn't too overpowering but if you don't like scented products then this might not be for you. I would definitely recommend that you try this product if you haven't already; it is the best foundation that I have tried so far. At £9.99 it for 30ml, it isn't the cheapest of drugstore foundations but it isn't the most expensive either, and to me it is definitely worth spending a little bit more money on a foundation that does the job well. You can buy Bourjois Healthy Mix Foundation from Superdrug and Boots. I'm using the bourjois healthy mix serum foundation, which I got for only 3 euro in a drugstore. It's my fav foundation so far and I absolutely love it! Love the review! I was going to pick this up the other week in Boots but i wasn't too sure! I haven't tried this, I was always a bit wary because my friend didn't like it. I've never heard of this brand before, but it sounds wonderful! I love foundations with moisturizer in it! I was going to try this out but its $32 here in Australia which is crazy! I went with a rimmel one for now instead! I love using my Bourjois Healthy Mix Foundation. thanks for your review, i was thinking of buying this product as well. i am not using foundation every single day just in special occasions like you, so i guess it suits me.